Pravo prijavljivanja i učešća imaju svi mladi iz Srbije starosti od 18 do 35 godina. Prijavljivanje se vrši popunjavanjem apliacione forme (ispod), za više informacija pišite na mail office@crps.org.rs sa nazivom mail-a “PP/ za Tursku”. Previously known as Antioch and located in the center of the first civilizations on the historical Silk Road, Gaziantep is Turkeys sixth largest city worldwide famous for its Baklava. The city of Gaziantep is one of the first settlements in Anatolia. Founded between the Mediterranean territory and Mesopotamia, the Mediterranean territory and Mesopotamia, the region developed with the establishment of many civilizations on site within the course of time. Gaziantep showcases many valuable and well-preserved artifacts, treasures and ruins of ancient civilizations that have populated the city for centuries in 13 different museums. The province is literally an open air museum with things to discover in every corner. Famous for its pistachios and its unique dishes the climate of Gaziantep is a blend of Mediterranean and Continental climate. The city, which is well known for its desserts and its cuisine, is awaiting also lovers of history and nature. personal and social responsibility, English language ability, and cross-cultural awareness and respect. should bring. because, we will build exhibition. to contribute to social development of Southeast of Turkey.To ensure communication between young people, Entertaining and instructive work to do. -On certain days, will Plans for photography. held cultural excursions. -Development of socio-culturel talk between the countries. established cultural dialogue. 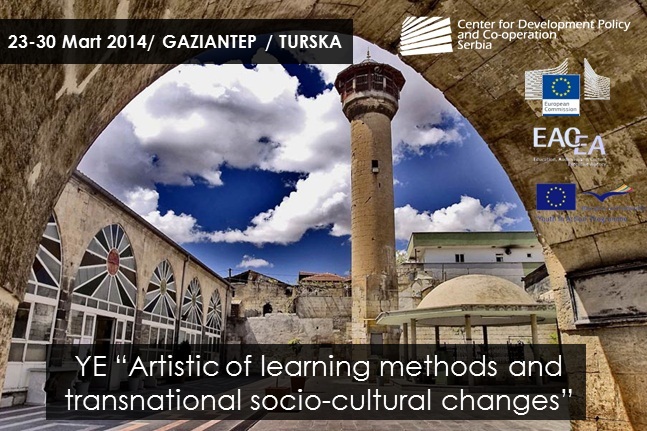 – Gaziantep trip will be .